The CAROUSEL BOUNCE HOUSE brings smiles and laughter. This is a ”turn of the century” tribute to the carousel. This is the largest of the Carousel Bounce Houses for rent. It measures 20 feet round. Ours is the largest available. We think, bigger is better in Texas. Starwalk of Dallas offers this affordable inflatable carousel in the Dallas/Fort Worth Metroplex. Starwalk of Dallas does the set-up for you. Our delivery services includes inflatable delivery, set up, and tear-down. This certainly comes in handy because our inflatables can be hard to manage. Enjoy the party and not the set-up and tear down. Leave it all in the hands of Starwalk employees. You will be able to sit back and relax. Enjoy your time with your kids. Also, our carousel is safe for children. It is made out of heavy duty commercial material. Finally, the Carousel inflatable uses (2) 20 amp circuit for power requirements. We can provide a generator if power is not available. Just remember to ask. 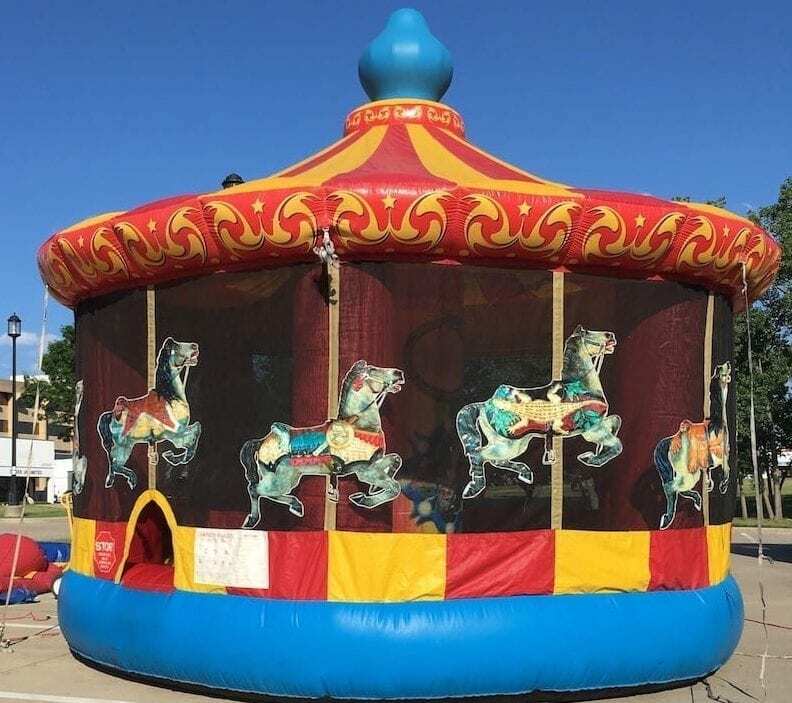 You can rent the carousel for kids parties, school event and church events. Certainly, our carousal is everything that a child might look for in an inflatable rental or bounce house. The carousel bouncer has bright traditional nostalgic colors like red, yellow, and blue that will for sure attract a child and keep a smile on their faces. Bounce houses have many names. They include Inflatable Jumpers, Moon Bounce and Inflatable Jumpers Bouncy Houses. They are also called Inflatable Obstacle Courses and bouncers. Whatever you call them, we are here in Richardson and Dallas for your party rental needs. We deliver Bounce Houses and Combo Bouncers within 10 miles of our Richardson location. We also deliver to Dallas, Richardson, Plano, Garland, Rowlett, Carrollton, Farmers Branch, Highland Park, University Park and Allen. Manufactured by Cutting Edge Creations.